Well I have a bit of a breather in my crazy schedule so I can now update you on my favorite time of year, Miss Rodeo America! For those of you that aren't really familiar with what we do here is a little insight into the girls crazy week. They arrived at the MGM Grand to check into rooms where they would be rooming with not only their competition, but chaperones. That's right for 8 days grown women are babysat by other grown women, this is serious stuff folks! They are then thrown into a whirlwind of events, competitions and appearances. Each day consisted of a different competition event, whether it was interviews, horsemanship, speeches or modeling. In addition the girls attended lunches, galas, and of course the National Finals itself. There were other categories that you would not expect, for instance throughout her year each girl must keep a scrapbook of their reign that they are then judged on. And you know the fabulous flapping chaps rodeo is known for, each girl designs and makes (or has someone else make) a pair of chaps used just to model in the pageant. The week went interesting as always, certain girls were projected to be the favorites but didn't quite measure, and jaw dropping statements are made like sleeveless dresses (gasp!) and high heels instead of boots occasionally. 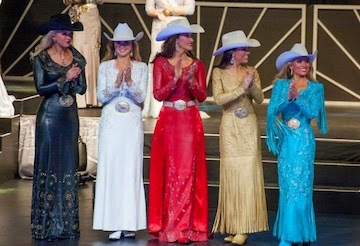 But at the close of 8 long days, celebrating the 60th anniversary of Miss Rodeo America, the girls danced their way onto the stage, introduced themselves, answered one last impromptu question, and waited for the fateful moment. The top 10 included many of the repeat offenders if you will, such as Texas and North Dakota however the appearance of the stunning Miss Rodeo Washington during the Top 5 was a first for the pageant. In the end our own Miss Rodeo California, Ondrea Edwards, did beautifully ending up 4th Runner up. To close it out Miss Rodeo Oklahoma Lauren Heaton was crowned the 2015 Miss Rodeo America. Now we have 4 more fabulous rodeo performances until the end of the magical season known as the National Finals Rodeo! yea they sometimes make the trip there, although its the Congress Queen's show for sure! Is Miss Rodeo America a title you are interesting in pursuing? interesting! those gowns are intense too - are they leather? yep I have a friend who competed in 08 and I idolize her!